Nite-Time – New York City’s Premier Party Band! Returns To Columbia College’s Reunion Weekend Starlight Reception. Record numbers of Columbia College Alumni turned out for reunion weekend (June 5 – June 7) this year to celebrate class years ending in 4 and 9. Attendees enjoyed activities including lectures, cocktail receptions and class dinners followed by the Starlight Reception on the steps of the Low Library. 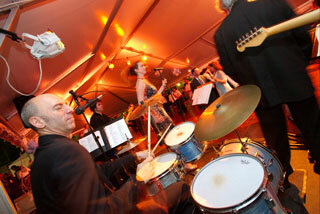 This year Nite-Time – New York City’s Premier Party Band! returned for the 10th year to rock the night away, and as always, played something for everyone. “They hit on songs from each decade, like a music history lesson that keeps everyone moving all night”, said one of the event’s organizers, “every year they come up with something unexpected to keep us on the dance floor”. This year the class of 1959 enjoyed such songs as “You Send Me” and “Run Around Sue”, while the class of 1979 danced until the wee hours to hits like “I Will Survive” and “Disco Inferno”. This year the class of 2004 broke every reunion attendance record in the history of Columbia and requested great songs like “Love Shack” and “September” which really got the crowd (and the band) rocking!